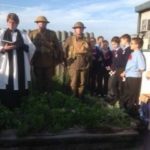 The Community Kids from the Bay have been personally selected to represent the Isle if Wight and participate in a project to commemorate the 100th anniversary of the First World War. They will be working with Osborne House Gardens and Grounds Staff to create a “Battlefields to Butterflies” commemorative ‘meadow’ in the walled garden at Osborne House as a joint Royal Parks Guild/English Heritage initiative. The Osborne meadow forms part of events to commemorate all Parks, Gardens and Ground staff, across the U.K., killed in action during WW1. 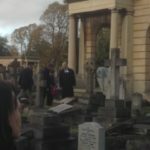 We made our first of three visits to Osborne House on Friday and learned that a key element of the project was to remember two Islanders, Ernest Johnson (died 30th December 1917) and Charles Mew (died 15th July 1916) who both worked for the Royal Parks. During our first afternoon session we planted poppy and cornflower seeds in the very potting shed that these men would have worked. It was a very moving and productive afternoon which involved learning experiences in maths, history, science, geography. The children planted 28 trays of seeds and we cannot wait to return in May and transplant the seedlings. 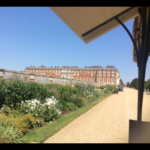 We are privileged to be part of this project and hope you will follow our journey which will form part of a commemorative feature at the RHS Hampton Court Flower Show 2018. The Community Kids are delighted to welcome Nell and June from the Sandown Afternoon Townswomen’s Guild. 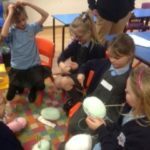 They are helping the children learn the skills of knitting and collage making. 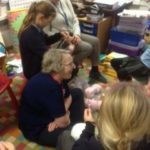 We are going to knit knee blankets for the residents of The Briars, to help keep them warm. 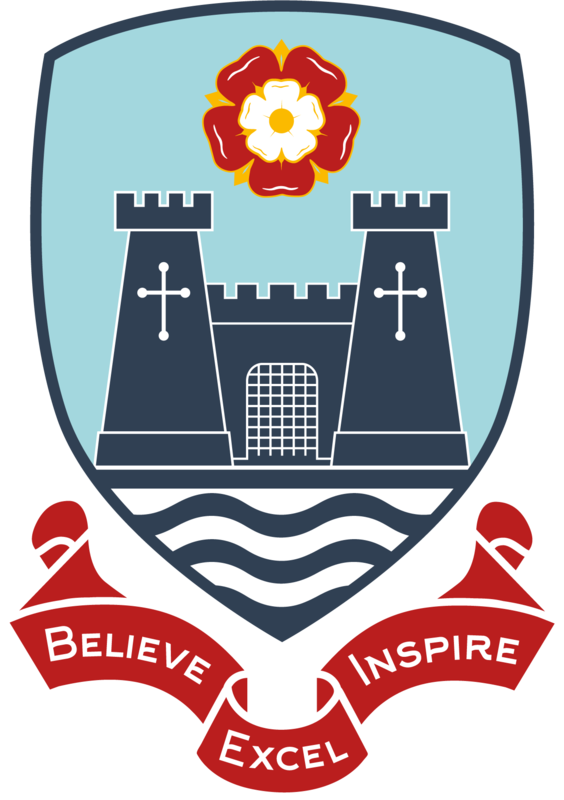 We are also making our school logo from felt and the Chelsea Pensioner’s logo in anticipation of our visit to The Royal Chelsea Hospital in March. 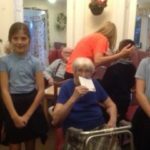 The children delighted the residents as they sang carols for them. The residents joined in with all the favourites Away in a Manger, Jingle bells and Rudolph the Red Nosed Reindeer. It was a wonderful opportunity to bring the younger and older generations together. The Community Kids were invited to attend a commemorative event at Ryde Esplanade on Monday. 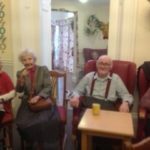 This was the first time some of our most recent members had been out into the local community. 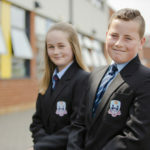 I was delighted with their behaviour, the respect they showed and they way they conducted themselves. We were joined by a group from Dover Park who have been inspired by the work we do for the Community Rail Partnership and they now maintain and look after the station at Ryde Esplanade. 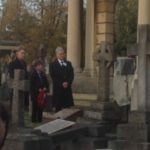 The short ceremony was delivered by Reverend Theobald in the company of Mayor Ross, a bugler who played the last post beautifully and a poem that was clearly and moving delivered by Ava Cowan from Year 6. 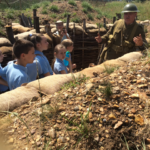 It was a very moving and a real living history day for all the children. 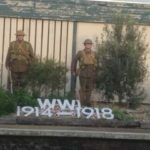 The fact that two soldiers dressed exactly as the soldiers would have been over 100 years ago made it hauntingly real and representative of a truly dreadful time in history. 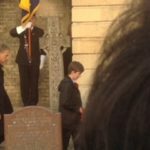 It brought a tear to everyone’s eyes during the minutes silence. 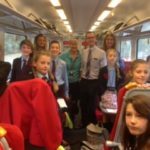 On Wednesday 7th, we had a wonderful journey up to London accompanied by South West Rail representatives who talked with the children about rail safety, and a tour of the train, followed by a quiz which Jodie won. She was awarded with a bag of goodies! Passengers departing from the train with us commented on how well behaved the children were. 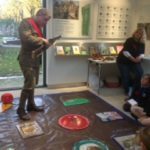 We received a warm welcome on arrival and were split into two teams and played a game answering questions about Royal Park gardens and we learned lots about the First World War. 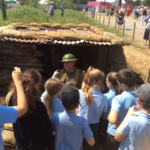 A soldier came to talk to the children about a day in the life of a First World War soldier. We then made our way for the official commemoration. 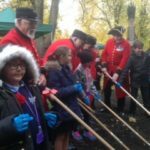 The ceremony was led by Wesley Kerr OBE and we were joined by the Chelsea Pensioners who joined the Community Kids to rake and sow poppy and wildflower seeds next to the monument that reminded us of the loss of 2625 Pensioners of the royal hospital Chelsea between 1855 and 1893. 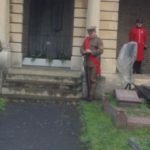 We made our way to the chapel area and a plaque was revealed to commemorate the loss of soldiers lost who worked for the royal park gardens and Mikey Watson laid the wreath under the blessed memorial. 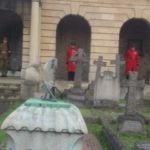 As the bugle played the last post we held a minutes silence and then slowly made our way out of the cemetery to begin our journey home. 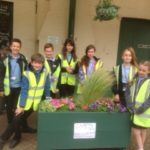 Our latest Community Kids initiative involved planting herbs in our four new planters at the station, in collaboration with the railway and ‘Aspire’, a group based in Ryde. 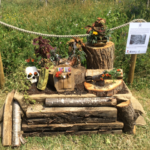 We have created four ‘Community Herb’ planters than can be accessed and used by the whole community who can come along, snip a few herbs and use them in their cooking! Sandown station and community kids were the first chosen to launch this initiative, we had photographs taken with a representative from Aspire and a local councillor. 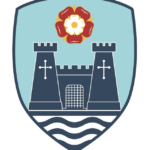 See article from County Press. 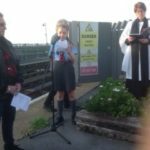 “GREEN-fingered primary school children rallied round to plant flowers and herbs at Sandown station, following recent vandalism. 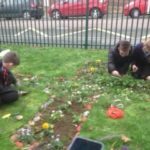 Children and their teachers from The Bay CE Primary School filled planters with colourful blooms and native herbs, replacing plants removed or damaged by vandals earlier this year. 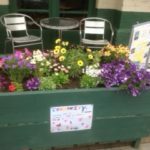 Wreckers had not only removed hanging baskets and other floral arrangements from outside the station and on the platform but they also damaged the station’s popular Gaslight cafe and toilet. It has all now been repaired. 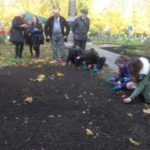 Herbs were courtesy of lottery-funded Grow Wild at Kew Gardens and Alice Thorp, community gardens co-ordinator at Aspire, Ryde, helped plant them. Morrisons supermarket also donated plants. Youngsters from the school had already planted ten fruit trees, given by Graham Deacon, of Deacon’s Nursery, Godshill, at the station.Tuesday’s event, organised by Bill Wyke who runs the after school club Community Kids, was attended by Sandown North Cllr Debbie Andre and Community Rail Partnership Officer Bobby Lock-Dean. 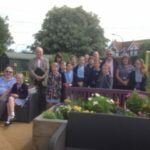 Update: The children met at Sandown station and showed Mike Fitt OBE all the hard work they had carried out on the station and then toured the outdoor school area with living crosses and finally The Briars residential home where the produce is growing wonderfully and the floral displays are amazing. 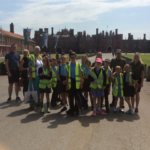 The children from Community Kids went on their second of three visits to Osborne House. We were excited and full of anticipation as we wondered how our seeds, that we planted back in the cooler day in March, had grown. We arrived to see our designated area looking very eerie and desolate, just as a battlefield would have looked like after conflict during the First World War! There were dead trees, crosses and craters left from the bombs dropped from the sky. We were amazed how our seeds had grown and got straight to work planting the seedlings into the ground. 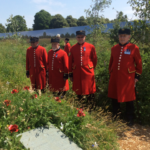 We planted over 200 plug plants and then finished by scattering seeds that have been collected from true battlefields and commemorative areas where many lost their lives. Our visit concluded with a rare glimpse of the sprinklers which are usual activated by a timer during the night, to avoid evaporation from the sun. 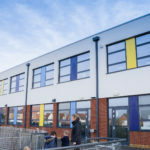 We cannot wait to return to our site again in June to see how the area will look, hopefully greener and ready to transform into a carpet of colour. 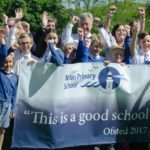 Hard work, a wonderful experience and again so many curriculum areas covered. Please continue to watch this space. Mike Fitt OBE came along to join us today. He instigated this project and highly regards the work that the Community Kids do. We may be invited to a rather special occasion. We will wait and see…. We returned to Osborne House yesterday to see how well our plants and seeds are growing. The flowers are beginning to show with the poppies and cornflowers beginning to raise their heads from the battleground. 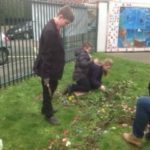 Community Kids weeded the area and painted commemorative crosses. 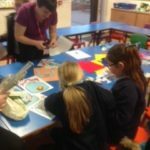 The children were then invited to assemble before the Deputy Lord Lieutenant where they received a certificate to thank them for participating in the project. We sang world war songs in front of parents and many guests and then laid our white crosses to commemorate all those soldiers who lost their lives in the First World War. What an amazing day we have spent at RHS Hampton Court Flower show. 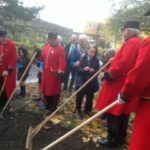 We were privileged to be invited to attend and share a very special celebration alongside the Chelsea Pensioners to commemorate and think about all the soldiers that lost their lives during The First World War. We were escorted to the site on a carriage drawn by shire horses. 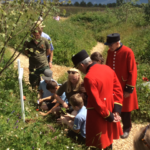 The Community Kids then planted poppies that they themselves had sown the seeds for, back in March and we escorted the Chelsea Pensioners through the ‘Battlefields to Butterflies Garden, that replicated the one that we have helped create at Osborne House. 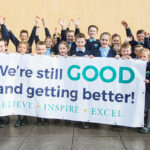 The celebration culminated with the Community Kids singing with Ali from the Gaslight Cafe in Sandown and the Chelsea Pensioners joining in with ‘Its a Long was to Tipperary’ and ‘Pack up Your Troubles in your old kit bag’. 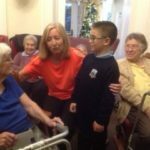 The Pensioners were so impressed with the children that they would like to visit our school and have extended an invitation to us to go up to their very special residential home for a tour! The Community Kids, as always were a credit to our school and all enjoyed a very long but exciting day! The Community Kids were invited over to The Briars to share Easter fun with the residents. We gave them the cards we had made for them and then participated in an Easter egg hunt! 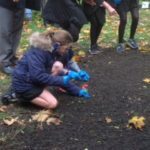 The children were able to see their wonderful display of daffodils that we worked hard to plant back in November for the residents to enjoy.